When a customer comes to your website and buys from your store, what happens after that? Sure, you package up the product and send it on its way (or have the automated digital download message go out,) but what about working to bring those customers back? Is there a way for you to make more sales after that sale or do you expect the customers to come back on their own? One of the glories of eCommerce is the automated receipt system. Not only do most eCommerce platforms like Shopify and Bigcommerce have built-in receipts, but you can often amplify their effectiveness by opting for a more advanced email system for receipts and transactional emails. We’re talking about sending out upsells and related products with the receipts, along with prompting abandoned cart customers to come back to the store. Coupons and discounts are often used throughout this process, and you can configure the emails to go out automatically. Quite a few eCommerce receipt and transactional email systems exist, but we want to find the ones that integrate with several platforms. So, keep reading to find some of our favorites. Conversio (formerly known as Receiptful,) has become a full eCommerce messaging suite, packed with beautiful HTML receipt emails that make your receipts look much better than what you would typically get with something like Shopify. You can brand your emails and add upsells and other interesting marketing items. Follow-ups, abandoned carts and newsletters are all included, along with interesting widgets for gathering reviews, feedback and recommendations. It’s by far one of the best ways to get more sales and communicate with your customers. The basic tools for sending out HTML receipts is completely free, but after that the plans start at $19 per month for stores that process up to 49 orders per month. The pricing goes all the way up to around $650 per month, and that’s for almost 70,000 orders per month. Which Ecommerce Programs Does it Work For? Remarkety is probably one of the biggest competitors to Conversio, and it offers dynamic personalization and branding for all eCommerce receipts. It provides instant marketing recommendations so you don’t have to think as much, and the email performance tracking is some of the best in the business. Transactional emails replace whatever you currently have on your platform, with options for order confirmations, updates, status changes and more. 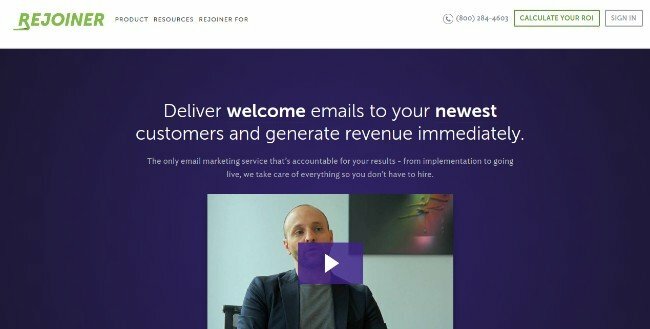 You can entice your customers back with the help of abandoned cart emails, while also using welcome emails and inactive customer reactivation. Remarkety starts at $25 per month for 500 contacts and unlimited email sends. They have three other plans, going all of the way up to $800 per month for 100,000 contacts. 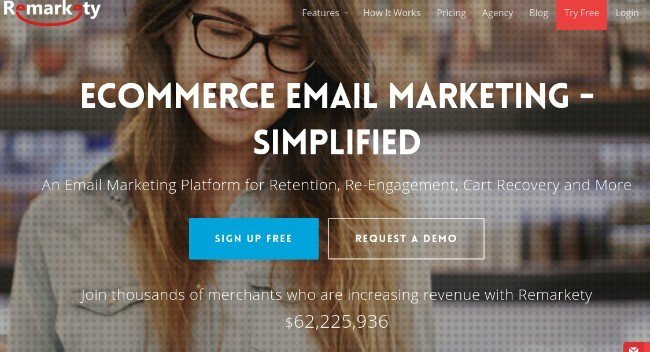 Consistent Cart is one of the most popular abandoned cart email apps for Shopify. 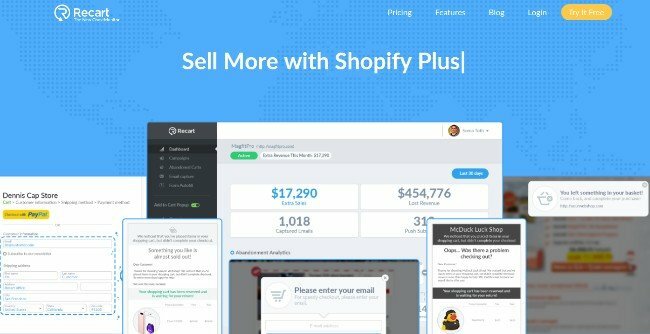 It has affordable pricing, beautiful templates and unlimited popups and abandoned cart emails. Every single cart that checks out or abandons on your website is shown in a sleek dashboard. Not to mention, you can send out push notifications to get more people back to your store. The app has a Basic plan that starts at $0. The Professional plan goes for $4.99 per month, and that includes all of the main features. You have to signup for MailChimp for this to work, but if that’s your email marketing software, you’re going to enjoy the eCommerce tools they have packed in. 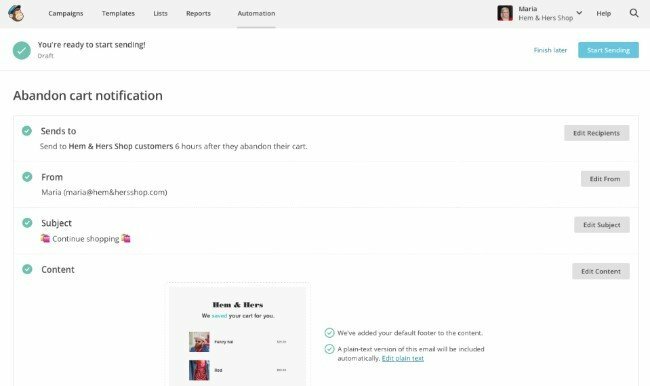 MailChimp lets you send out your traditional email newsletters, but you can also sync your products to send out product features. Connecting your store only takes a minute. After that, it allows you to configure a complete abandoned cart system, and it also has everything from product recommendations to demographic predictions. If you’ve ever used MailChimp you know how smooth the email sending is. Not to mention, the reports through MailChimp are some of the easiest to understand. The first 2,000 subscribers are completely free with MailChimp. After that it all depends on the number of subscribers, but it does start at $10 per month for slightly above that 2,000 mark. You could end up spending thousands of dollars if you send out tons of emails. The Recart eCommerce receipt system strives to help you sell more throughout the course of the year. 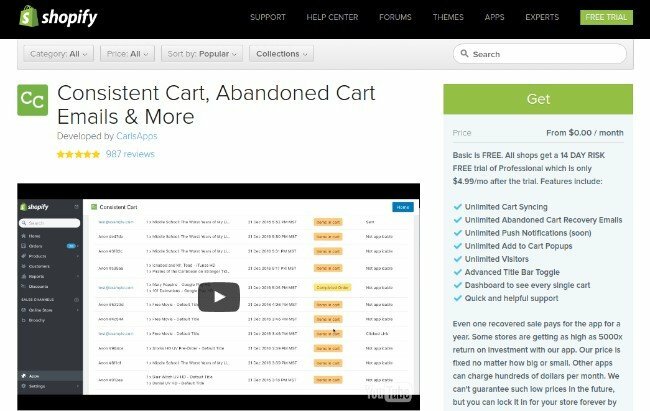 You gain access to abandoned cart emails and push notifications. They even have a feature coming soon that sends out text messages for abandoned carts. One of the coolest features is called cross-device cart rebuilding, which tries to juggle the carts being created when users go to your shop on different devices. Therefore, customers can pick up where they left off, whether it was on their phone, computer or tablet. Recart begins at $29 per month for up to $1,000 in extra sales it brings in. That’s pretty cool considering they don’t take your money for sales that you would have otherwise made before installing the app. After that they have various other plans, going up to around $299 per month for up to $20,000 in additional sales. A big part of the transactional email process involves sharing shipment tracking. Most customers can’t imagine shopping online without receiving a nice email prompting them about all shipping updates. In short, they want to see every stop the package makes until it hits their doorstep. 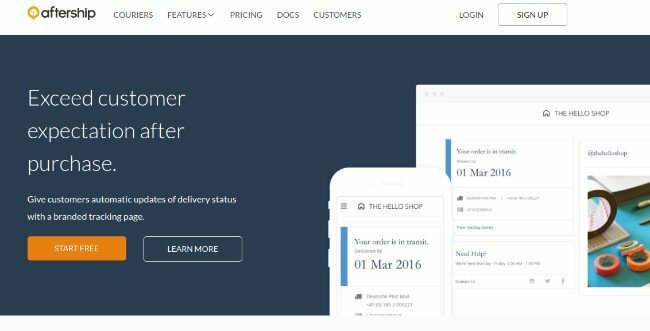 AfterShip handles this for you with analytics, notifications, a tracking button and a page for people to visit and see their shipments. The main part of it is sending out notifications, so your users open up the email when purchasing a product and click through to check on their status updates. AfterShip has a free plan for up to 100 shipments per month. There’s also a Premium plan that starts at $10 per month for over 100 shipments per month. 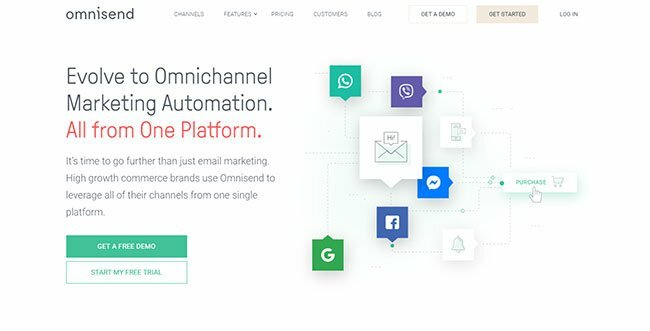 Omnisend features automated emails, bulk emails and signup forms for eCommerce. With inexpensive plans, it’s nice to see that the developers offer everything from abandoned carts to welcome emails and reactivation to order follow ups. You’ll also find some other handy tools for birthday emails and configuring beautiful forms. It’s kind of like MailChimp, but they’ve obviously focused more on eCommerce as a whole. It offers a free plan for sending up to 2,000 emails per day. After that it starts at $16 per month and goes up depending on the amount of subscribers. Rejoiner is one of the lesser known transactional email tools, but it has everything you need packed into the suite. The main problem is that they don’t seem to have preset plans for thinking about your budget in advance. However, the abandoned cart emails are easy to configure, and they craft the email copy for your brand, so you can focus on other things. This is more of a partnership you create with Rejoiner, seeing as how they give you a person to speak with and make your emails look amazing. Cart regeneration is seamless, and the product suggestions come in handy when trying to figure out how to get more revenue through your store. You have to contact them to get custom rates. Nothing is published on their website. 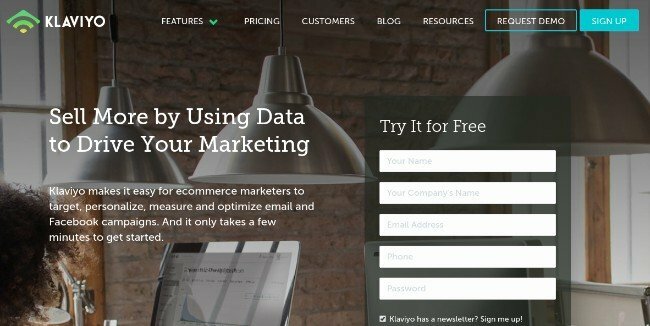 Klaviyo integrates with your eCommerce platform in one click, using templates to design your emails and interesting campaigns for abandoned carts, welcome messaging and win back campaigns.The autoresponders come in handy, but the main reason most people go with Klaviyo is for the advanced segmentation. It has a free plan for up to 250 contacts. After that you’ll pay around $25 per month. This can go up to more than $1,000 per month depending on your company. Which One Should You Choose for Transactional Emails and Receipts? If you’re currently using MailChimp, the eCommerce tools in there are hard to pass up. If you’re a Shopify user, I’d recommend Conversio and Consistent Cart. The AfterShip app is one of the few options with shipping confirmations, but my favorite all-in-one options for transactional emails and receipts are Conversio and Remarkety. If you have any questions about the best email systems for eCommerce transactional emails and receipts, let us know in the comments below.